Microsoft released Windows 10 Technical Preview build 10061 on Wednesday afternoon with more substantive changes than the prior release, including new Mail and Calendar apps and a raft of improvements to the UI. The first lucky users will only be those in the Fast ring, though. We downloaded it right away—read all about the new crop of changes. Windows 10 preview users in the so-called Fast ring get updates sooner, but with a greater risk of bugs. Those users will receive the new build in a Windows Update. Microsoft appears to be taking it easy with this release to minimize issues related to an upgrade bug that cropped up with the prior build, where updates took hours because the installation loaded all the Language Packs. Microsoft provides guidance for reclaiming storage space from the unwanted language packs. Build 10061 follows soon after build 10049 rolled out in late March. That build’s main event was the debut of the lighter-weight Project Spartan browser, the replacement for Internet Explorer. Why this matters: Microsoft’s Technical Preview strategy for Windows 10 has had its rough patches, like the update issues with build 10049. Overall, though, it’s proven to be a great way to build anticipation and support for Windows 10 by engaging users—and fixing the issues they find—long before the OS rolls out officially. The biggest changes in build 10061 are the new Mail and Calendar apps. A new three-pane email interface features a toggle to quickly flip back and forth between Mail and Calendar. This will make it easier to move between communication and scheduling tasks. You’ll also be able to make your own Swipe Gestures to execute actions like moving, deleting, or marking emails. 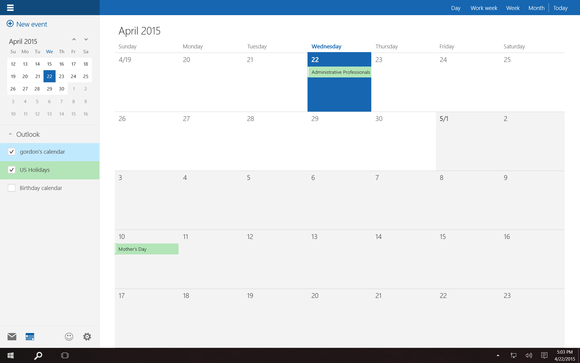 You can blip between the new Calendar and Mail easily in the latest build of Windows 10 Technical Preview. Microsoft Word will be the inspiration for what Microsoft’s Gabe Aul calls the “email authoring experience.” Users will be able to add tables, photos, and formatting devices like bullets and colored text more easily. The new Mail and Calendar apps will be able to work with Office 365, Exchange, and Outlook.com, as well as Gmail and the IMAP and POP protocols, among others. Here’s a change everyone will love: The Start menu will be resizable. 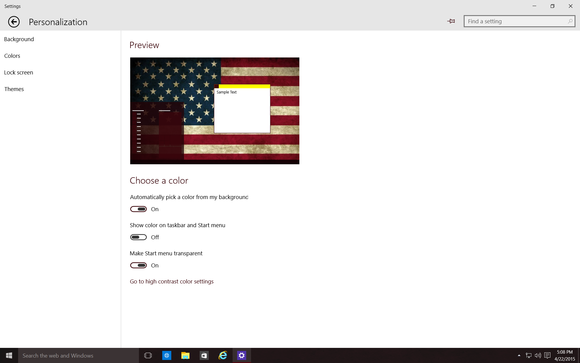 But build 10061 also brings visual improvements to the Start menu, Taskbar, and Action Center. Using the Personalization options in the Settings menu, users will be able to adjust the color scheme and transparency of these elements. Microsoft helpfully provides more material, including a new monochromatic scheme called “black system,” and AutoColor, which takes the predominant color from your desktop to use with these elements. The latest Windows 10 Technical Preview adds more control over the look and feel of the Start menu. Microsoft has also re-tuned the Taskbar for tablet use. Triggering Tablet Mode in Windows 10 will expand the size of the Start, Taskbar, and Cortana buttons to make them easier to tap. Virtual desktop users, go nuts: With build 10061, Microsoft has thrown open the door, allowing an unlimited number. That’s right, unlimited. Should any users go bonkers and fill their display space to bursting, the blog post says a new “overflow experience” will let then move among the virtual desktops with some ease. Build 10061 comes at a time of growing anticipation for Windows 10. Rumors are already swirling (fueled by a recent slip of the tongue by AMD CEO Lisa Su) about when the OS will finally be ready. We downloaded the update right away; check out our hands-on of build 10061.